Ultimate trip: China & Australia in one! 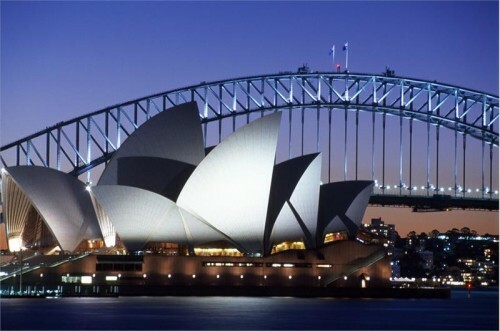 Shanghai & Sydney for €638! China Eastern Airlines still offer offer few last days for their exceptional tariff that can be interesting for all travellers who want to visit two countries in one for super low price. 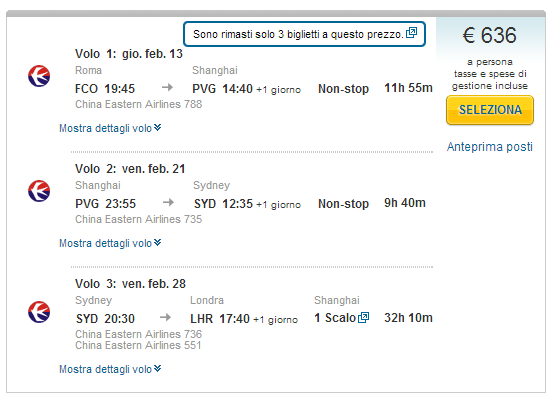 You can now book flights on route Rome – Shanghai – Sydney – London for only €638!! You can spend a week or two in both Shanghai and Sydney and then fly back to London. Normal prices for flights to Sydney are at least €1000! You can combine your dates as you wish, for example stay just couple of dates in Shanghai and then spend almost 1 month in Sydney. This price of course includes 20 kg checked-in luggage! Book via multicity search at Expedia.it (Volo -> Più destinazioni). Shanghai offers both cheap and luxurious accommodation so comparing all hotels in town before your trip can save you a lot of money! Sydney is not exactly cheap destinations but it offers wide range of accommodation so if you look around a bit you can find some pretty good deals for both hotels in Sydney and cheaper hostels. Why not to rent a car and explore whole Australian East coast? There is so much to see and with a car your transfers will be so much easier. « Cheap flights to Portugal in October: Porto for €46!